February | 2009 | Ipoh Mali Talak Sombong! Taking a short break from the overdose of fishy pictures from the previous Sawatdee post, here’s something about Ipoh from my visit last month during Chinese New Year. When Steven asked me to meet him at Medan Ipoh Bistari (the new stretch of shophouses next to Tesco Taman Ipoh), little that I know we’re going to have soya milk and Taiwanese snack for lunch. Yong He Soya Milk (direct translation from the Chinese words on the signboard) opened its door back in September/October 2008, being the first eatery that serves Taiwanese drinks and snacks in Ipoh. Yong He actually was the name of a suburb of Taipei famous for its breakfast foods, notably soya milk. I am not sure how authentic the food you can find here compared to the streets of Taiwan (haven’t been to Taiwan yet but will do someday), but the prices were shockingly cheap. For example, the drinks above costs RM 2 each. The Rice Milk Ice was actually grounded peanut drink, very similar like our peanut congee (fah sang wu) but in a watery state. 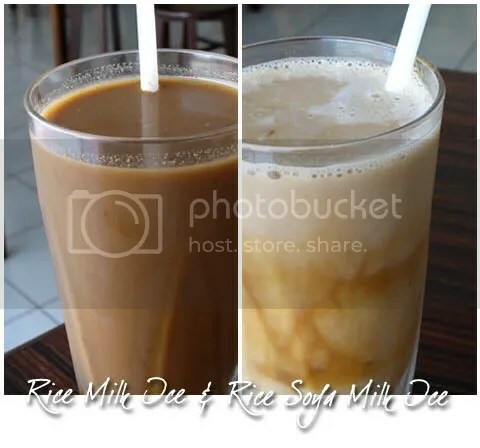 Rice Soya Milk was basically a mixture of soya milk with the peanut, which I found quite interesting but the strong peanut flavour masked the taste of the soya milk. Here’s something more interesting; Salty Soya Milk (RM 2.50). At first, I thought that salty soya milk means plain, unsweetened soya milk… added with salt. Naive… yes, I admit that. 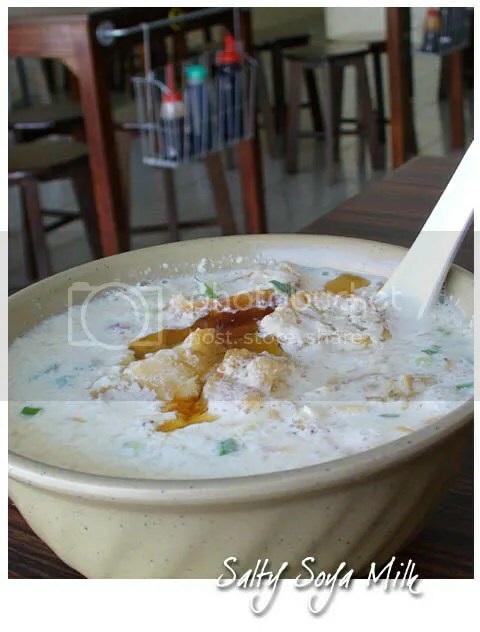 It turned out that more ingredients went into the salty soya milk such as fried Chinese crullers (yau char kway), chopped spring onion and a dash of sesame oil. Can’t remember if there were any minced meat in it, though. I think it would be more appropriate to call it “soya milk porridge”. An acquired taste, both of us couldn’t finish it. Here’s something really tasty, Pork Chop in Egg Crepe (RM 3.50). 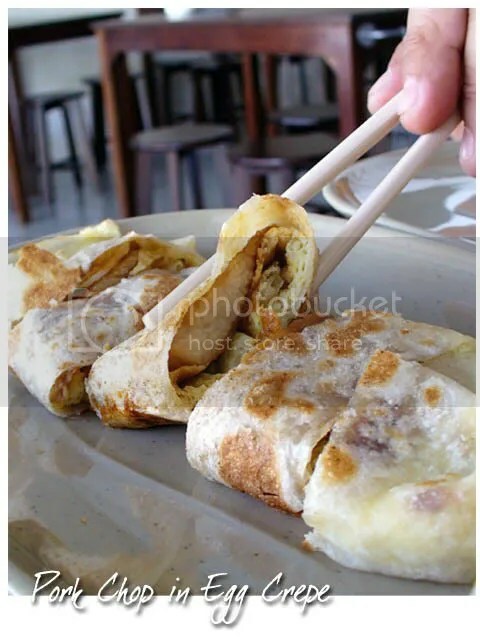 The egg crepe (roti canai look-alike) were warm, thin and crispy, enveloping the juicy, fried pork chop cutlets. Goes really well with the chilli and garlic sauce combination. Instead of pork chop, you can choose ham or bacon as the filling too. Meat Bun (RM 0.80, I think the pricing was incorrect, it’s darn cheap but that was stated on the receipt) tastes similar like xiu long bao without the soup. 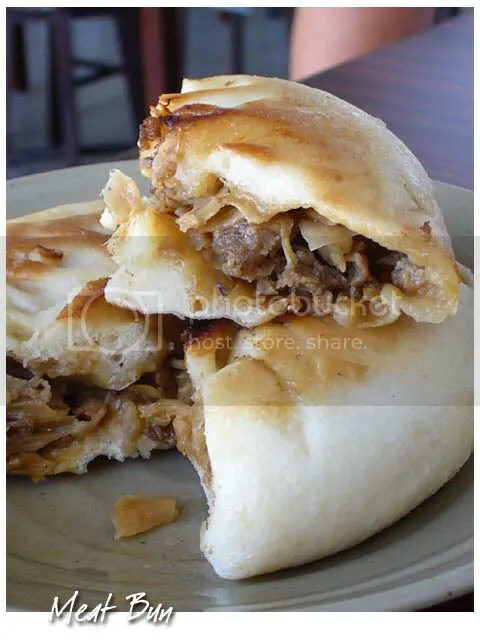 The minced pork were sufficiently marinated with browned onions but the bun skin was tad chewy. 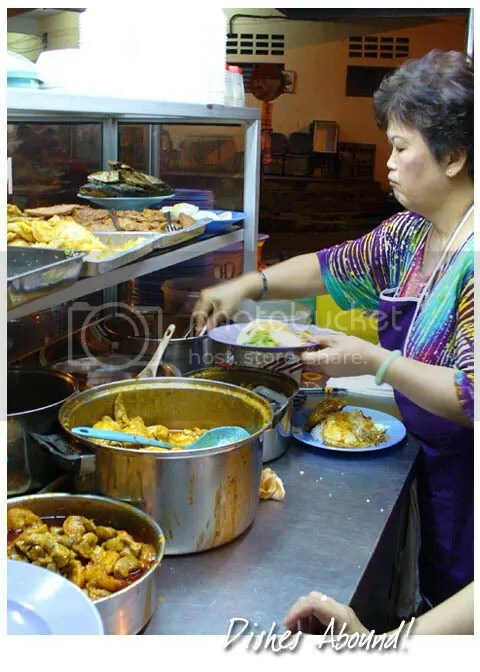 I’m always quite skeptical to have any pan fried kuih made from flour or rice flour as they tend to have the typical “cockroach smell” if the flour’s not fresh. 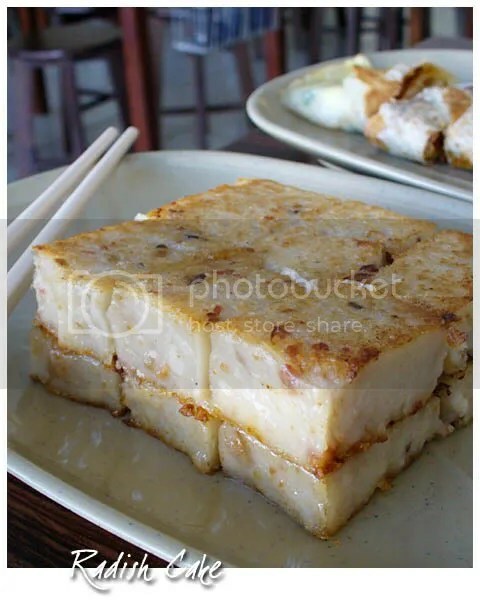 Fortunately, the Radish Cake (RM 2.50) we had were free from any weird smell. Not one of the best I have ever eaten, as the texture was soggy and very soft. I would advise to stay away from the rice roll (RM 3.50), as the rice were tasteless, hard and clumpy despite it was served warm. 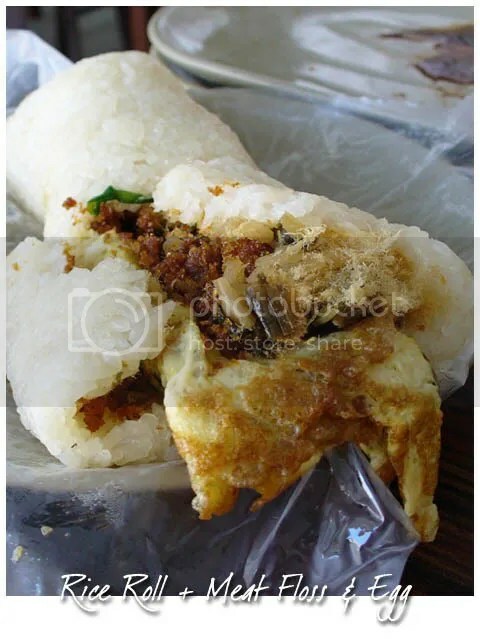 The filling were not bad though, with egg omelette, dried shrimps, meat floss and preserved mustard. See also comments from J2Kfm . If you have been following my blog, I’m sure you have read my praises for Sawatdee, a humble little Thai restaurant smacked in the middle of Bandar Puteri, Puchong. The food were gorgeous and the service was friendly. I got a call from Somjit, the owner (can’t recall the date but it was before Chinese New Year for sure) after my first visit in November, asking me to drop by, as she’s gonna revamp the menu and will have a photo session (taking pictures for the menu) on that particular Sunday. Somjit intended to take as much pictures of all the dishes that day, either they’re for the new menu or future use, hence she also asked a friend with DSLR to come along. Unfortunately, I couldn’t stay there the whole day for the shooting, so I only managed to take some of them. According to Somjit, she plans introduce more variety of dishes into her new menu and increase the serving portions too (something like banquet style). The Deep Fried Fish with Spicy Garlic and Sweet Basil Leaves was good; the meat were firm and fresh, laced with mild spicy garlic flavour. The deep fried basil leaves provides a refreshing citrusy taste and crispy texture to the fish. The Deep Fried Fish in Three Flavours Sauce tasted pretty much like sweet and sour fish, except there were ginger and spring onion added to the sauce. 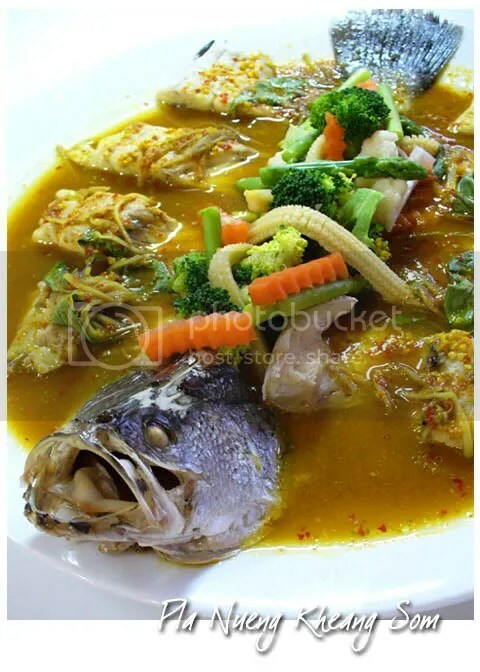 The combination of sweet, sour and spicy goes well with the fish. Have you tried Thai-styled otak-otak before? 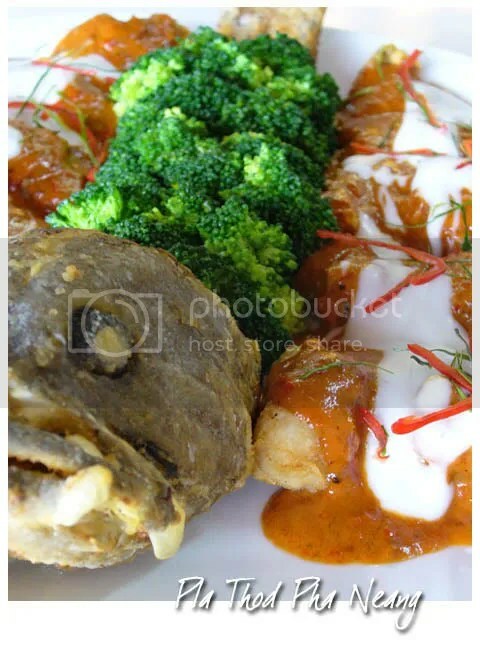 If yes, this Deep Fried Fish in Dry Curry Paste tasted pretty similar to that, except the cooking method (the fish for otak-otak were minced, while this one is deep fried and served with broccoli). 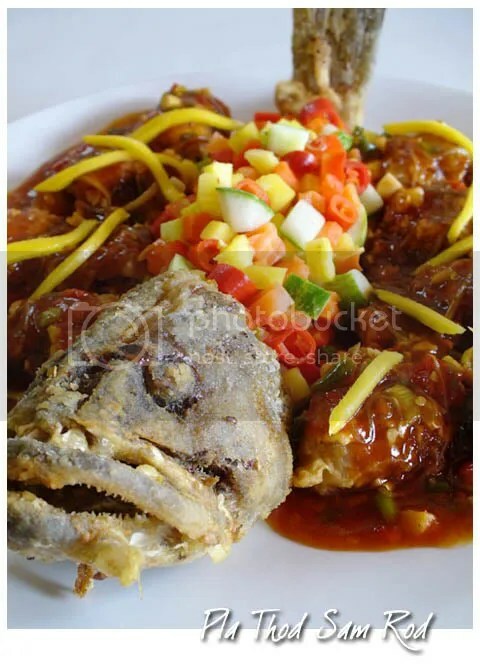 I think Somjit did a good thing by combining two different dishes into one, such as this Deep Fried Fish with Mango Salad. Mango Salad is my favourite Thai salad (read more here). 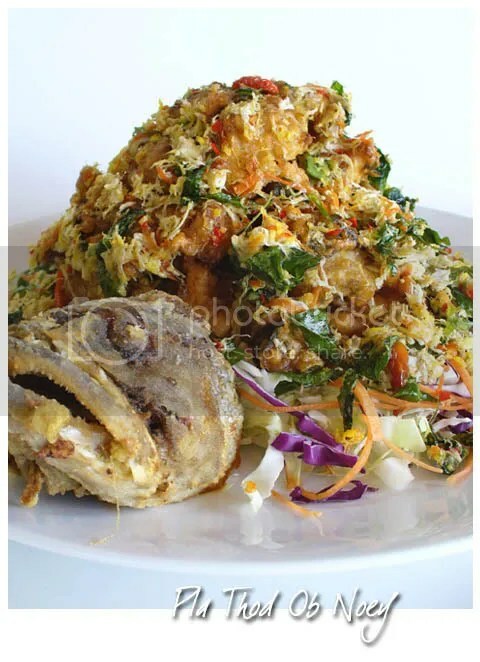 The salad (prepared with shredded young mangoes, onion, cili padi and cashew nuts) lent a tangy twist to the dish. A prettily garnished dish, Sawatdee Special Deep Fried Fish in Batter came with abundance of fish fillets, basil leaves, vegetables and egg. The batter was light, not too thick to mask the flavour of the fish. Too much deep fried fish? 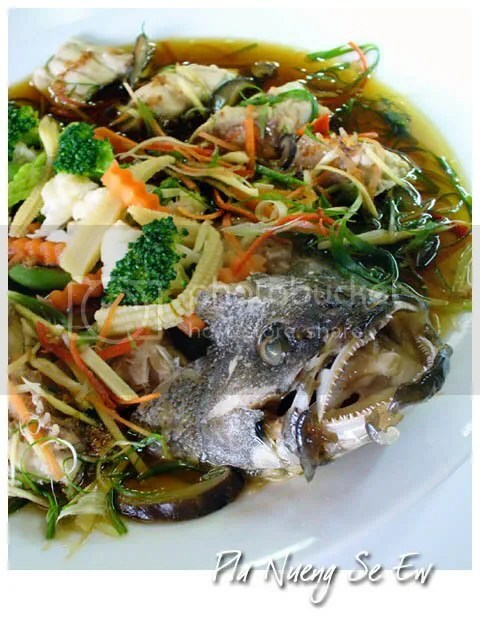 Here’s a steamed version, Steamed Fish with Soy Sauce, served with plenty of vegetables such as mushroom, young corn, carrot, broccoli and cauliflower florets, chilli, ginger and parsley. A very healthy dish! 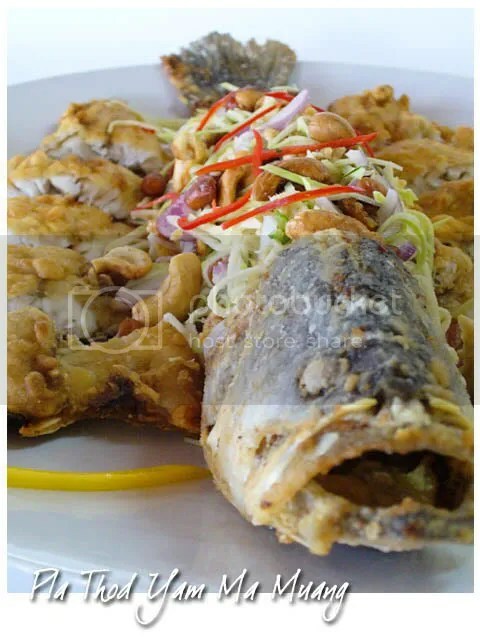 The steamed fish doesn’t have any muddy or fishy smell and the soy sauce complements the fish nicely. While I didn’t try the Steamed Fish in Yellow Curry as I am stuffed at this point, it looked rather delish. The gravy could be thicker though as it seems a bit watery here. Read my previous post on Sawatdee here, in case you haven’t. Don’t know what to eat for lunch or dinner? Don’t know where to go for lunch or dinner? Wanna save money and refrain from splurging on food, but at the same time, the food has to be good taste? When it comes to save money on food, usually there are only a few choices. Rice and noodles are the most basic. Chuck away pasta, exorbitant meat dishes, seafood and sashimi and hawkers are the way to go. 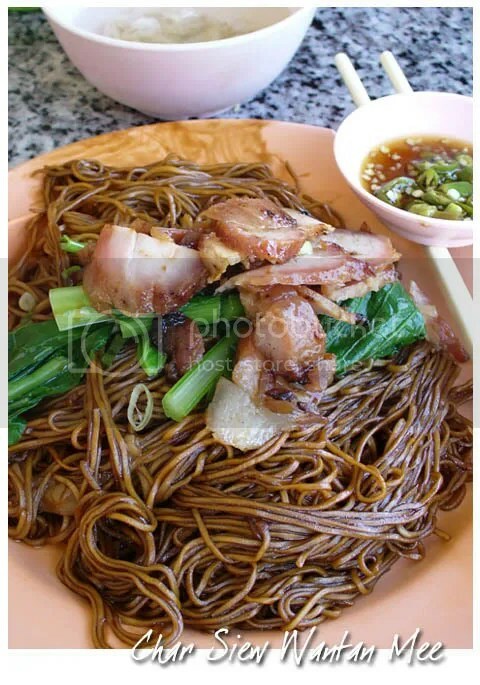 I recently stumbled upon a shop in Damansara Jaya that serves decent wan tan mee. 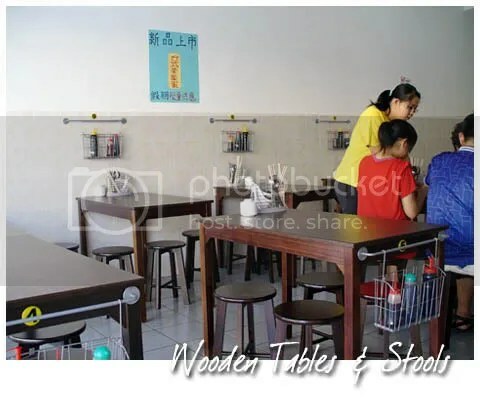 The stall is located in Koon Kee Restaurant, a corner shop lot. Behind it is the Atria Shopping Centre. I’m not sure if this is the famous Koon Kee wan tan mee from the same place in Petaling Street or Damansara Uptown (all three shops bear the same name but different shop facades and location) but there’s a perpetual crowds queuing up at the stall. The noodles were cooked to the perfect texture but a bit dry. The char siew were pretty ordinary, nothing to rave about but the wan tan were juicy, can almost tell that the grounded pork they use are very fresh. Priced at RM 4.50 (if I’m not mistaken) for medium serving, they however, doesn’t serve pickled green chillies. 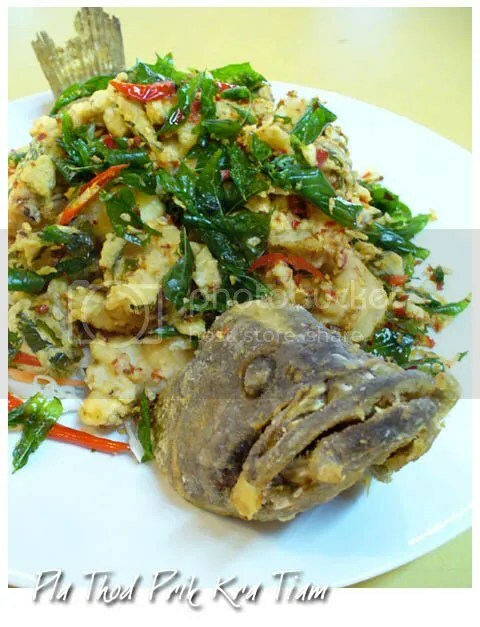 They substitute it with cili padi instead. 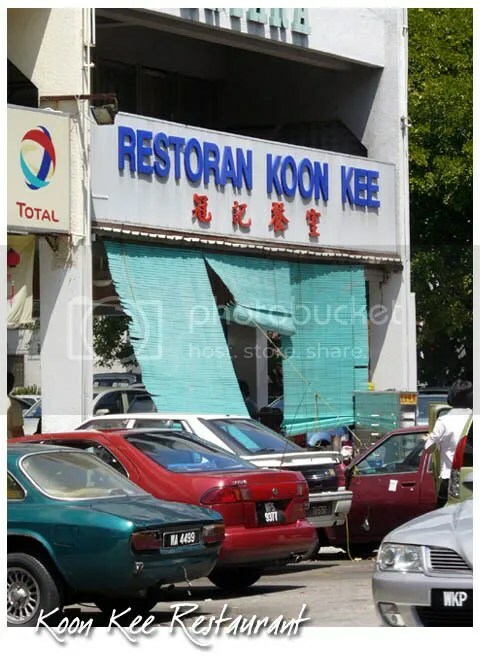 I can’t recall the address for Koon Kee Restaurant but Atria Shopping Centre is just behind it. There’s a small Malay food court located next to the shop, if not mistaken. 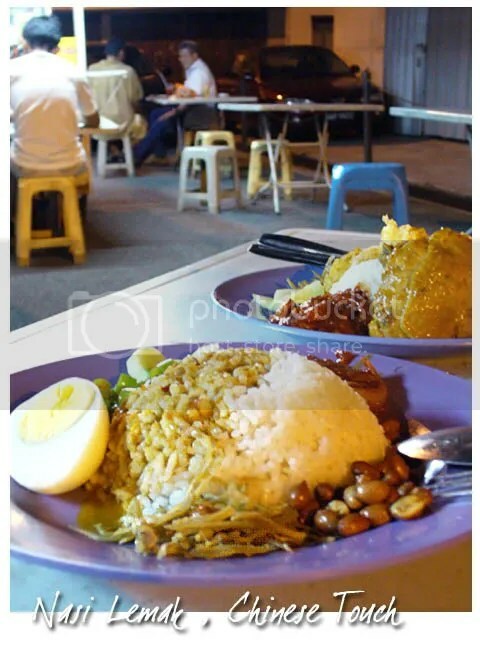 Nasi lemak can be found almost every corner of Malaysia; foodcourts, Malay stalls, mamak, cafes like Little Penang Cafe, higher end eateries such as Madam Kwan and so on. Many different version of nasi lemak appeared, tweaked to suit every tastebuds. But how often did you see nasi lemak served the typical Chinese style (meaning: non-halal) with the side dishes of your choice? It looked rather like an usual chap fan (economy rice) hawker stall with about ten side dishes to choose from to go with the fragrant and fluffy rice cooked in coconut milk. 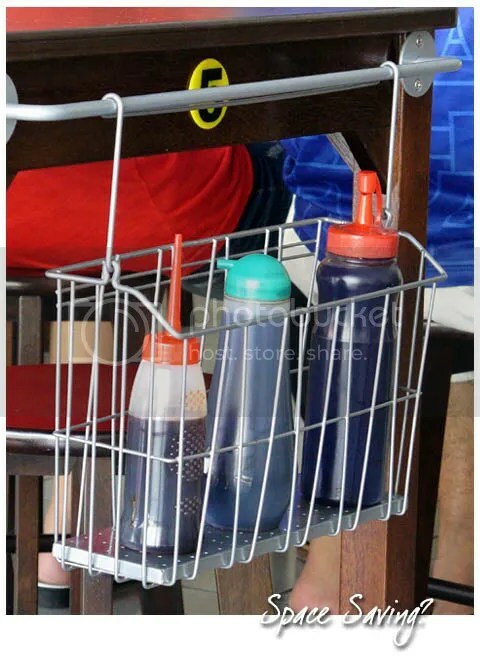 Upper shelf are the trays of Chinese sausages (lap cheong), luncheon meat, fried eggs, some kacang buncis and others. Pots of chicken curry, wild boar curry, prawn and petai sambal, ikan bilis sambal and other fiery hot items are lining up below the shelf, all screaming “scoop me, scoop me!” But I didn’t succumb to the seductions – I opted for the original, with a bit of the chicken curry gravy. Every spoonfuls of the rice has the home-cooked feel to it, like how Mom used to cook it. Price? Depending on the side dishes you choose, the price varies (especially when your inner self is yelling “I want a bit of everything!”). More San Peng at A Whiff of Lemongrass and Lushia.